Women in Peru, particularly those in remote and rural communities, continue to be disadvantaged in areas such as education and employment. In rural areas, 1 in 4 women have had no formal education and less than 60% of women are active in the workforce. However, research has shown that when women have equal access to employment and education, their entire communities can benefit. In partnership with local organisation, CCAIJO, Mary MacKillop Today supports rural artisans through regular skills development and business training with the aim of providing these artisans, in particular women, with the skills to generate an independent and sustainable income. These artisans also have the opportunity produce handmade Fair Trade products during the course of their training which are made available for sale in Australia through Mary MacKillop Today’s Fair Trade organisation, ethica. Valentina is an outstanding knitter; she makes the beautiful alpaca scarves and beanies. 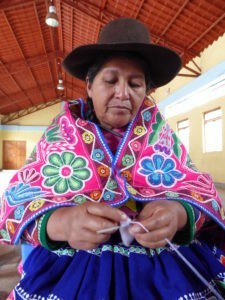 She has been able to earn an independent income to support herself and her family, while also learning skills in production, design, marketing, small business management and leadership. Valentina has been a member of the Puka Phallcha association for 12 years, and has served as the President, Secretary and Treasurer of the association. Through these roles, Valentina has come to know her own potential to be a leader, not just in the association, but in her community. She now understands that men and women are equal, and should be given equal opportunities to work, to education and to roles in local leadership. This year, thanks to her involvement in the association, she has also been accepted into a leadership program for rural women. These are amazing achievements in any context; however they are made even more so when you consider that Valentina never even finished school. However the most important change is that this additional income will allow her 17-year old son to complete his high school education at the end of this year. Thanks to his mum’s hard work and income, he will now have opportunities that his parents never did, demonstrating that when women have equal access to employment and education, their entire family and their community can benefit. 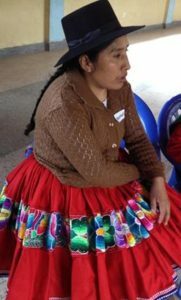 Pray: Pray for the women of Peru that they may realise the great potential that lies within them to contribute to their families and their communities.